Setting Goals This Year? Should You Bother? Have you ever stopped to think about why we set goals for ourselves? You only have to look at the statistics to realize the odds are stacked against us. 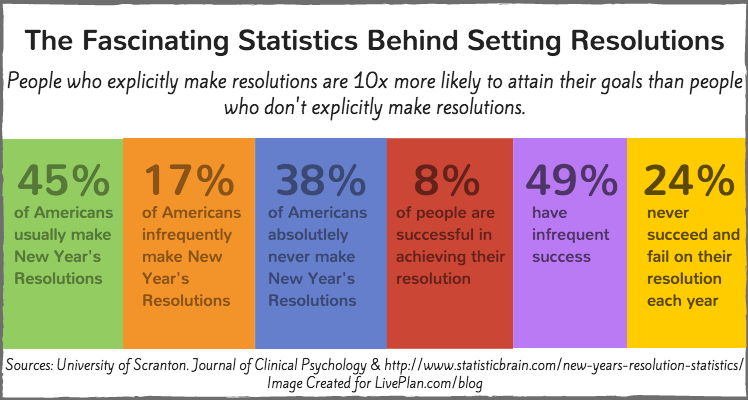 According to the Statistic Brain Research Institute, 45 percent of Americans usually make one or more New Year’s Resolutions. Of these, only eight percent are successful. That means millions of people won’t be doing those things they set out to do: lose weight, spend less, stop smoking, or cut down on drinking, to name but a few of the most common. We often set goals—whether it be in our personal or business lives—without thinking about why we’re doing it in the first place. “I’m going to get fit” or “I want to make more money”—If this sounds like you, you’re not alone. The problem is that these types of statements are just that—statements that have little meaning, no reasoning, and that lack specificity. This is why it’s important to consider a series of objectives before attempting to reach that elusive goal (more on that later). If you’re struggling to achieve your goals, don’t throw in the towel just yet. 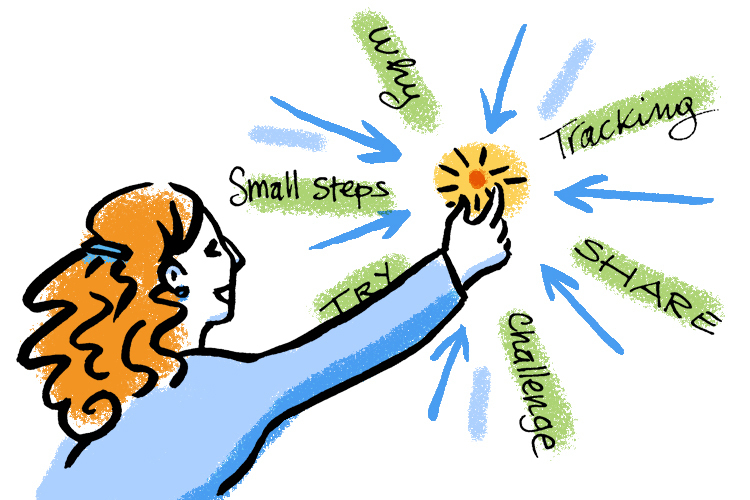 This article explores goal-setting, motivation, and how to stay on track. After reading through to the end (don’t quit halfway), you may have found that much-needed motivation to set some meaningful, achievable goals of your own. You’ve probably learned from multiple sources how Michael Jordan was cut from his high school basketball team, and that J. K. Rowling was rejected by a dozen publishers before going on to author Harry Potter, the best-selling book series in history. There is one thing that sets these people, and people like them apart from those who give up: motivation, the desire to do something. And that “something” has to have a reward attached to it to make it worthwhile. Some people do things for money or to receive an accolade, or because of extrinsic factors. Others just want to feel good about having achieved something, or intrinsic factors. Would you go to work everyday if you weren’t getting paid? I know I wouldn’t. It’s also important to recognize what you perceive as “success,” and to make note of your attitude toward failure. Research shows that highly successful people have a strong motive to achieve, whereas their less successful counterparts focus on avoiding failure. Do you tend to blame external factors when you don’t succeed? Or do you take responsibility, persevere, and view setbacks as an opportunity for growth? I’m not going to lie, I’ve played the blame game when things haven’t gone my way and realized it’s neither helpful nor constructive. That kind of negative energy is detrimental, and corrodes motivation. Not everyone has the self-motivation to follow through on their goals, particularly over a long period of time. It’s easy to lose momentum and the drive to succeed unless you have a way to keep the end goal realistic and relevant. Whatever your goal, make sure to keep track of how you’re going. The best way to do this is to decide how you’ll measure success right from the start. It also helps if your goal is as specific as possible. For example, regularly checking your waist circumference is a simple way to measure a weight-related goal. If your goal is to be more productive, this is more difficult to measure, but it’s not impossible. In what way would you like to be more productive? Is there a set number of tasks or projects you’d like to complete this week? This month? Think about what it is you really want to achieve and find a simple, effective way to monitor it and receive regular feedback. Author of “The Entrepreneurial Instinct” Monica Mehta explores how the brain processes success and failure, and how this then impacts subsequent successes (or failures). According to Mehta, when we experience success, our brain releases dopamine, or the “feel-good” hormone. Each time this happens, we are motivated to continue to succeed and re-experience the same positive feelings. The opposite is true when we experience failure. That’s why so many people fail to reach their goals the first time, feel like crap, and then give up so as to avoid the disappointment again. Break the bigger goal into smaller bite-size chunks, and celebrate each small success to keep those dopamine levels up. Having a clear purpose for wanting to achieve your goal is a powerful motivator to see it through to the end. It’s very different to want to earn millions of dollars just to feature in the Forbes World’s Richest People list, as opposed to wanting the money to fund scholarships for the underprivileged. If you can articulate why you want to achieve something, you’ll know it’s worth the effort. If you’re setting a goal for the sake of it, or just to copy someone else, the goal has no personal meaning. Whether you reach it or not doesn’t matter. Not very inspiring, is it? Let someone close to you, or a group of people, know about your goals. This way, you become more accountable for your actions and have the support from others to keep you going. Even better is if you can partner up with someone who has a similar goal so you can support each other. Regular praise from your network can give you a much-needed boost at critical points in your quest for success. This injection of positivity is something you can’t get if yo go at it alone. On the flip side, it’s much easier to quit if you’re the only person you have to answer to. You don’t have to be all work and no play while taking those steps to victory. You should be setting goals that are challenging, but that are also interesting, inspiring, and that make you want to get out of bed in the morning. Take time out to reward yourself and give yourself permission to take breaks when the going gets tough. It all comes back to the reason for why you’re doing it in the first place. If you can’t have a bit of fun along the way, is it really worth it? Just as much as a goal should be achievable, there’s little point in setting a goal that’s too easy. If you’ve already run several half marathons, it’s clearly not going to be too taxing to take on one more. Signing up for a full marathon or ironman competition then is a different story. Doing things that stretch and challenge you is what makes life exciting, and makes the feeling of achievement that much sweeter. A goal is an aspirational statement based on what you want the future to look like. Objectives are the exact steps you take to reach that goal. This is when you should be thinking S.M.A.R.T. (specific, measurable, achievable, results-focused, and time-bound). If your goal is to improve efficiency in running your business, that’s great, but it’s too generic. You need a roadmap to help get you there, and this is where objectives come into play. You may have a number of objectives sitting underneath the overarching goal. For example, one supporting objective could be to decrease product delivery times. Digging deeper, objectives can be underpinned and measured by key performance indicators, or KPIs. Following the previous example, an appropriate KPI would be “percentage of orders delivered within three business days.” You may decide that 75 percent is the benchmark, and any figure above this means that particular KPI has been met or exceeded. Going back to tracking success, KPIs are a fantastic tool to report on progress, particularly in a business setting. A KPI dashboard is visually appealing, and is a simple way to monitor how you’re going at regular intervals. Why do you think so many fitness trackers have apps with quick-view dashboards containing all your health and activity data on a single page? Why does it feel so good when you reach your daily steps target and the dial goes from red to amber to green? It’s just how our brain works—we love to experience success. There’s that dopamine again. A dashboard is also a great way to share information with others. Remember, being accountable is key to maintaining focus and motivation. You should now have enough information to have the confidence to set challenging but achievable targets, and conquer them. Don’t be afraid of failure when trying to reach your goals. You often learn more from your mistakes than from your successes. Once you get a few wins under your belt, this will keep you motivated. Success breeds success. This year, how are you going to make sure that you’re part of the eight percent and succeed in what you set out to achieve? Have you found an effective way to set, measure, and reach your goals?